It's hard to find words to describe the stunning beauty and rich fragrance of the 'Stargazer' lily. This is a hybrid lily that was developed in the late1970s. It's popularity was immediate and 'Stargazer' continues to be one of the most beloved flowers for gift plants, cut flower arrangements, and special occasions such as weddings or holiday events. The perfect choice for brightening any room. Makes a breathtaking potted specimen plant. Very decorative on a small table or windowsill. 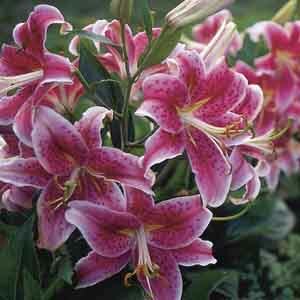 Oriental lilies can be grown as perennials in most regions. Plant outdoors in the garden when flowering period is complete.